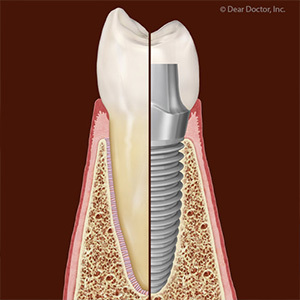 There are several reasons why dental implants are so popular. Perhaps the most important, though, is their longevity: if maintained properly implants can last for decades. However, they’re not indestructible—certain mouth conditions could put them at risk for early failure. But if you address emerging problems early, you may be able to prevent that unfortunate outcome. Your implants may be in danger, for example, if you have a teeth grinding or clenching habit. This occurs when a person involuntarily and repeatedly bites down on their teeth when not chewing or speaking. Usually triggered in adults by high stress, teeth grinding can subject both natural teeth and implants to damaging levels of force. Over time this can cause bone loss around an implant and weaken their support. It could also cause a direct break in an implant. But there are ways to stop or at least reduce the effects of teeth grinding. One effective way is a custom-made bite guard you wear while you sleep. Made of hard plastic, the guard prevents the teeth from making solid contact with each other, reducing the amount of force generated. A more prominent problem is periodontal (gum) disease, a bacterial infection caused by built-up dental plaque on tooth surfaces. This can trigger inflammation, a normal defensive response that when it persists for an extended period of time can damage tissues and supporting bone. It can also cause a specific form of gum disease related to implants called peri-implantitis, in which the tissues that support an implant become infected and weaken, leading eventually to possible implant failure. If you have implants, then, you should brush and floss daily to prevent gum disease, as well as see your dentist at least every six months for cleanings and checkups. And if you notice anything like reddened, swollen or bleeding gums, see your dentist immediately. The sooner you undergo treatment, the better the outcome for your implants as well as your overall health. Dental implants can give you years of great service and can prove to be well worth the cost. But you’ll have to stay on your guard against gum disease and other mouth conditions that could endanger them down the road. 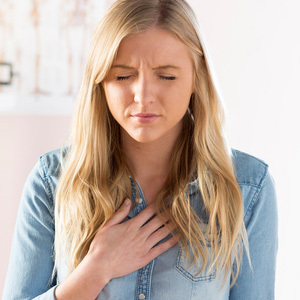 Gastroesophageal reflux disease (GERD) is a digestive disorder that can lead to a number of serious health problems. One of them, tooth erosion, could ruin your dental health. Your stomach uses strong acids to break down food during digestion. A ring of muscle just above the stomach called the esophageal sphincter works as a one-way valve to allow food contents into the stomach but prevent acid from traveling back up through the esophagus. GERD occurs when the esophageal sphincter weakens and starts allowing acid into the esophagus and potentially the mouth. The acid wash can eventually damage the esophageal lining, causing pain, heartburn, ulcers or even pre-cancerous cells. Acid coming up in the mouth can cause the mouth’s normally neutral pH to slide into the acidic range. Eventually, these high acid levels soften and erode tooth enamel, increasing the risk of decay and tooth loss. Accelerated erosion is often a sign of GERD—in fact, dentists may sound the first warning that a patient has a gastrointestinal problem. Unfortunately, a lot of damage could have already occurred, so it’s important to take steps to protect your teeth. If you’ve been diagnosed with GERD, be sure to maintain good oral hygiene practices like brushing or flossing, especially using fluoride toothpaste to strengthen enamel. But try not to brush right after you eat or during a GERD episode: your teeth can be in a softened condition and you may actually brush away tiny particles of mineral. Instead, wait about an hour after eating or after symptoms die down. In the meantime, try to stimulate saliva production for better acid neutralization by chewing xylitol gum or using a saliva booster. You can also lower mouth acid by rinsing with a cup of water with a half teaspoon of baking soda dissolved in or chewing on an antacid tablet. You can also minimize GERD symptoms with medication, as well as avoiding alcohol, caffeine or spicy and acidic foods. Try eating smaller meals, finishing at least three hours before bedtime, and avoid lying down immediately after eating. Quitting smoking and losing weight may also minimize GERD symptoms. 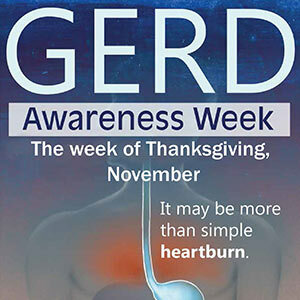 GERD definitely has the potential to harm your teeth. But keeping the condition under control will minimize that threat and benefit your health overall. 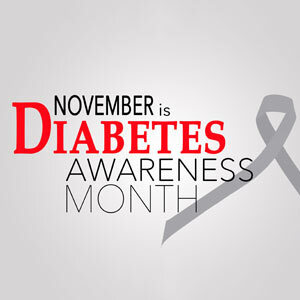 The American Diabetes Association has declared November National Diabetes Month. If you or a loved one has diabetes, you may already know that diabetes puts you at greater risk for gum disease. Let's look at four must-know facts about diabetes and gum disease. #1. Gum disease is an acknowledged complication of diabetes. High levels of blood sugar can interfere with your mouth's ability to fight infection, making you more susceptible to gum disease. People with poorly controlled diabetes may have more severe gum disease and may ultimately lose more teeth due to gum disease—in fact, one in five people who have lost all their teeth have diabetes. #2. Gum disease makes diabetes harder to control. Diabetes and gum disease are a two-way street when it comes to adverse health effects. Not only does diabetes increase the risk of gum disease, but gum disease can make diabetes harder to manage. Infections such as gum disease can cause blood sugar levels to rise. This is because chronic inflammation can throw the body's immune system into overdrive, which affects blood sugar levels. Since higher blood sugar weakens the body's ability to fight infection, untreated gum disease may raise the risk of complications from diabetes. #3. You can do a lot to take charge of your health. If you have diabetes and gum disease, you may feel as if you've been hit with a double whammy. While it's true that having both conditions means you are tasked with managing two chronic diseases, there is a lot you can do to take care of your health. Do your best to control blood sugar by taking prescribed medications, following a balanced diet, and exercising. In addition, pay special attention to your oral healthcare routine at home: Brushing your teeth twice a day and flossing once a day can go a long way in preserving good oral health. #4. Preventing and managing gum disease should be a team effort. We can work together to prevent, treat, and control periodontal disease. Come in for regular professional dental cleanings and checkups so we can monitor the health of your teeth and gums and provide specialized treatment such as deep cleanings when necessary. Diligent dental care can improve your oral health and help control your diabetes. Cardiovascular disease and periodontal (gum) disease are two different conditions with their own set of symptoms and outcomes. But they do share one common element: inflammation. In fact, this otherwise normal defensive response of the body might actually create a link between them. When tissues become damaged from disease or injury, the body triggers inflammation to isolate them from the rest of the body. This allows these tissues to heal without affecting other tissues. If inflammation becomes chronic, however, it can damage rather than protect the body. This happens with both cardiovascular disease and gum disease. In the former, low-density lipoproteins (LDL or “bad cholesterol”) in animal fat leave behind remnants that can build up within arteries. This stimulates inflammation of the vessel’s inner linings, which accelerates hardening and increases the risk of heart attack or stroke. With gum disease, bacteria living in a thin, built-up film of food particles on the teeth called plaque infect the gum tissues, which in turn trigger inflammation. A struggle ensures between the infection and inflammation, causing the gum tissues to weaken and detach from the teeth. Coupled with erosion of the supporting bone, the risk of tooth loss dramatically increases. Recent research now seems to indicate the inflammatory responses from these two diseases may not occur in isolation. 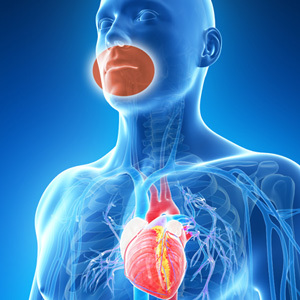 There is evidence that gum inflammation could aggravate inflammation in the cardiovascular system, and vice-versa. The research, though, points to some possible good news: treating inflammation in either disease could have a positive effect on the other. Making heart-friendly lifestyle changes like losing extra weight (especially around the waist), improving nutrition, and exercising regularly can help reduce LDL and lower the risk of arterial inflammation. Likewise for your gums, daily oral hygiene and visiting the dentist at least twice a year reduces the risk for gum disease. And at the first sign of a gum infection—swollen, reddened or bleeding gums—seeking immediate treatment will stop it and reduce any occurring inflammation. Taking steps to prevent or reduce inflammation brought on by both of these diseases could improve your health and save your life.